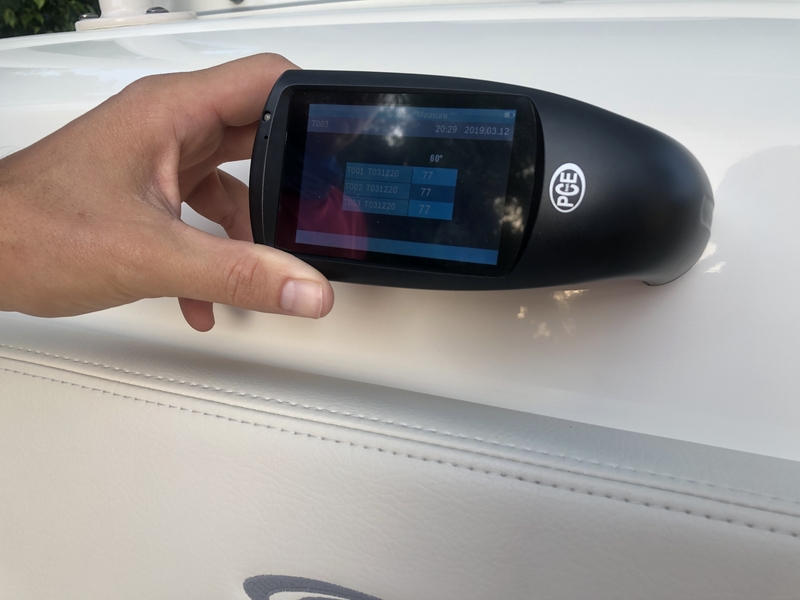 Scott recently purchased a brand new 2019 277CC Cobia, and after making such an investment into his boat, looked for ways to protect his boat moving forward. One step included purchased a full length boat cover to protect from the elements while the boat was sitting on the trailer. The next step included researching a marine protective top coating that would protect the integrity of the fiberglass and gel coat on the hull and top side of the Cobia. After much online research and reading numerous great reviews of the Glidecoat Top Coating Kit, he reached out to us about using our protective ceramic coating on his new boat. 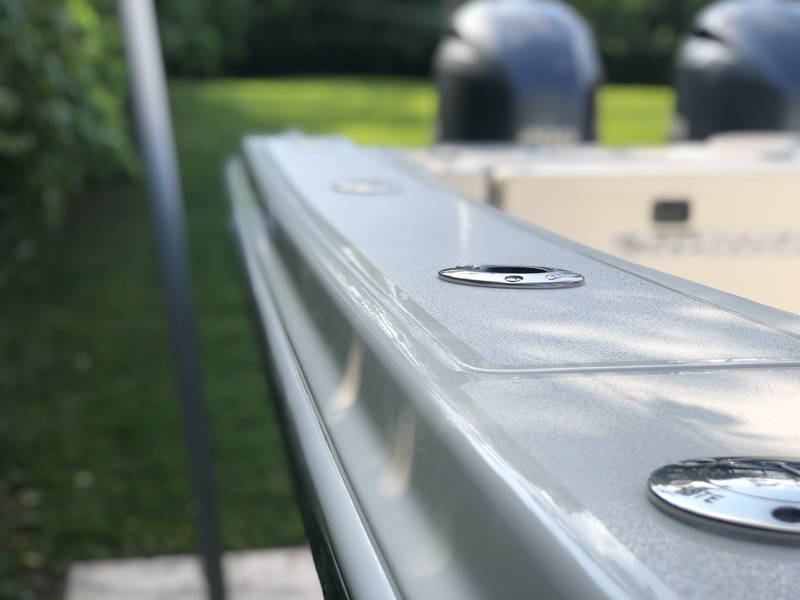 For boat owner's, it can be challenging to determine the best marine protective top coating to be applied to their boat after such a large purchase like the Cobia. From our initial conversations with Scott, he mentioned his research on The Hull Truth and other forums about Cobia's and continually found great feedback about the Glidecoat Top Coating Kit. Considering our focus in the marine industry, customized marine protective top coating, great customer feedback and the tons of similar case studies, Scott could easily notice the strength of our ceramic coating compared to the competition in the market. If yourself as a boat owner are currently researching for the best way to protect your boat and noticing tons of inexpensive products in the market that are making strong claims, we hope you take the similar approach as Scott to thoroughly review the product, find actual evidence of the performance of the ceramic coating and make your decision from there. Noticeable watermarks and dirt sitting on the surface of the hull. The project requirements included prep and ceramic coating application to the entire top side including the non-skid. As you will notice in the bottom right hand section of this photo, the non-skid already had some staining on the surface when we first arrived to the boat. We have noticed boat owner's are becoming more aware to the advantages of ceramic coatings and the value of an application upon a recent purchase of a brand new boat. With that said, a vast majority of boat owners, believe that no restoration work would be required on a brand new boat. And, unfortunately to say, that is does not hold true based on our experiences. To get the best results with the Glidecoat ceramic coating, you want the surface to be is as great condition as possible before the ceramic coating application and the coating will lock in the surface condition. 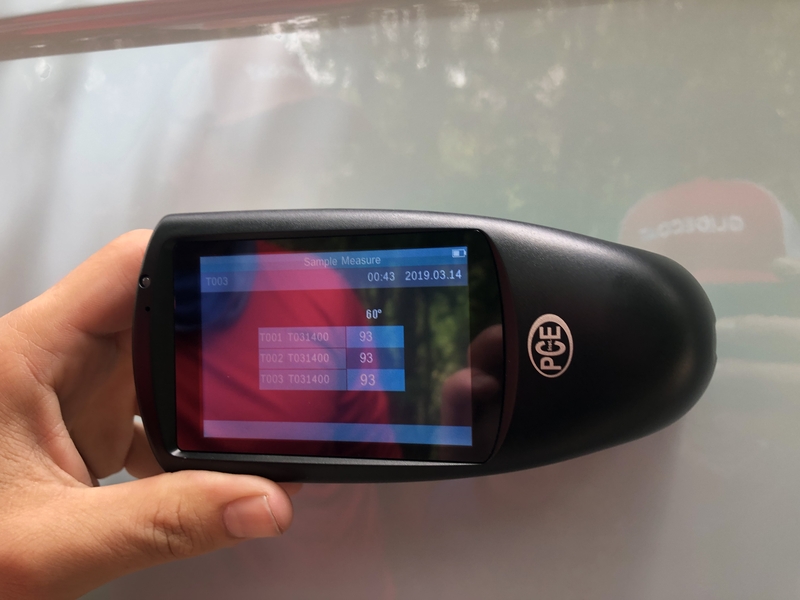 The first step when arriving at a boat before we start the multi-step ceramic coating application process is to take gloss meter readings and photos of the entire boat to show the transformation for the owner and to display the results in case studies. 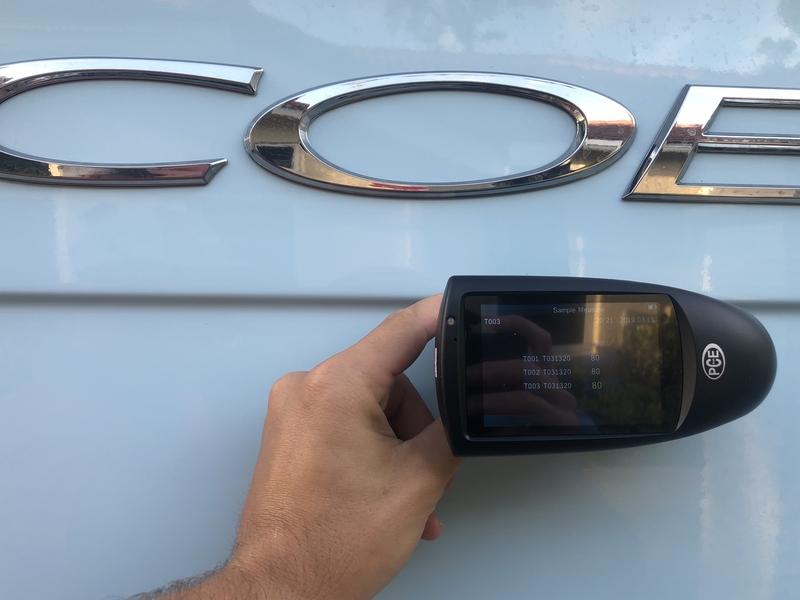 As shown in the image below, the gloss meter reading on the port side, just beneath the "Cobia" name registered at 80. This falls inline with our expectation considering brand new boats typically have readings from 80 - 86. 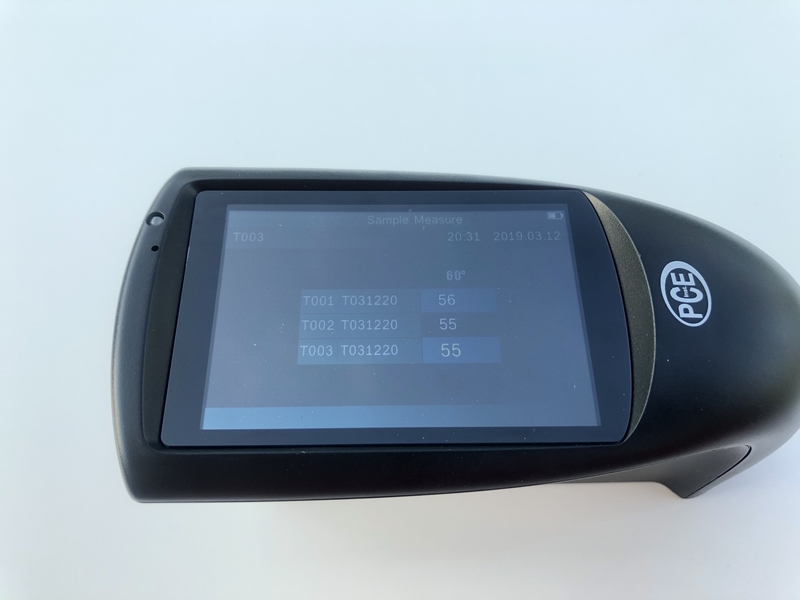 Surprisingly, the top side had a wider range of gloss meter readings in various areas with the readings registering as low as 55 and up to 77. 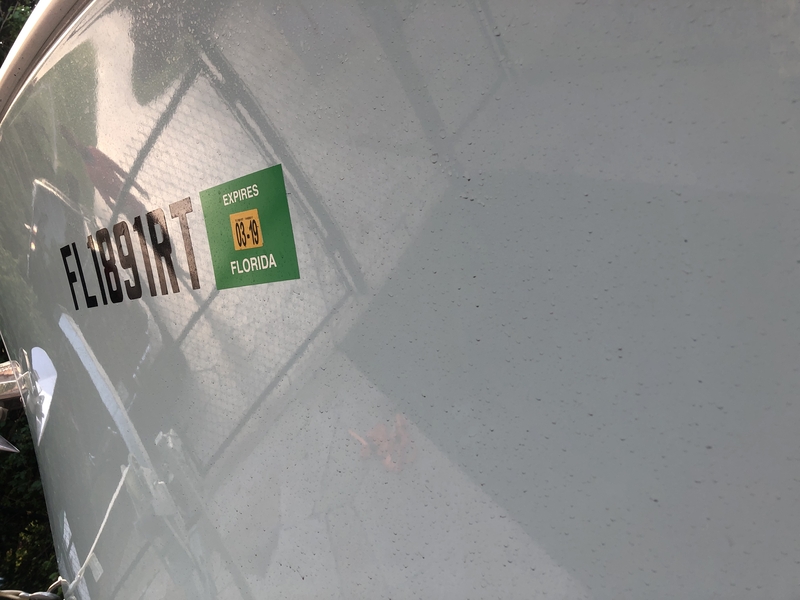 Considering the boat was nearly brand new, the gel coat was in great condition and high gloss meter readings throughout the boat, we only needed to complete one pass with our medium nano compound with a foam pad and a random orbital buffer. As mentioned above, most boat owners believe no buffing would be required on a brand new boat. However, since we wanted to boost the gloss on the surface, clean up the surface and remove any surface imperfections, at least one pass with the nano compound is necessary to achieve those objectives. 4). Apply second and final coat of Glidecoat Nano Ceramic Top Coating by hand with soft applicator sponge. 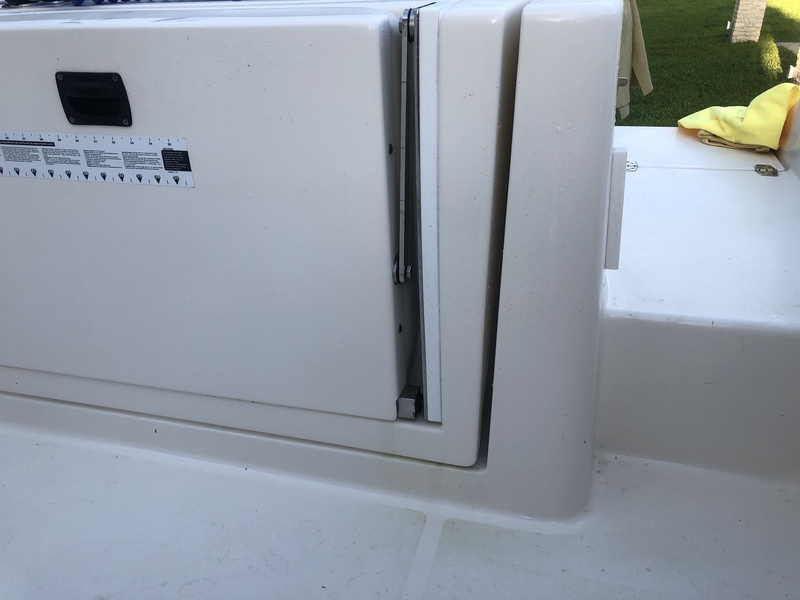 After completing these steps to the hull, the gloss meter readings jumped from 80 to 93, which is a 15% increase in the gloss of the surface and higher than factory new. Non-skid has its own set of steps required to prep, compared to the flat fiberglass areas. We never use a buffer over the non-skid areas, as the abrasion can effect the integrity of the surface on the non-skid. We use a combination of our Glidecoat Nano Wash, heavy degreaser, and soft scrub, with a firm bristled bush to thoroughly clean the non-skid. Our goal when prepping the non-skid to is remove any and all staining and dirt before proceeding to the surface wipe and coating steps. Once the non-skid has been prepped, we use our Surface Wipe decontaminate followed by one coat of our nano ceramic coating. The coating process is the same when working on non-skid compared to flat fiberglass, working in small 2 foot by 2 foot sections and hand buffing with a microfiber towel. More effort is required when buffing the coating the non-skid, as the texture of the surface can make it more difficult to smooth out the coating while removing any excess. We only recommend one coat of our ceramic coating on the non-skid, which will provide ample protection without making the surface too slippery when wet. It's always great to see the transformation on each boat and even a brand new ones like this Cobia. Seeing a 15% gloss meter reading increase on this boat once again showed the top performance of the ceramic coating. 93 gloss meter reading after restoration and Glidecoat marine fiberglass top coating application. Great shine to the railing after Glidecoat marine fiberglass top coating application.